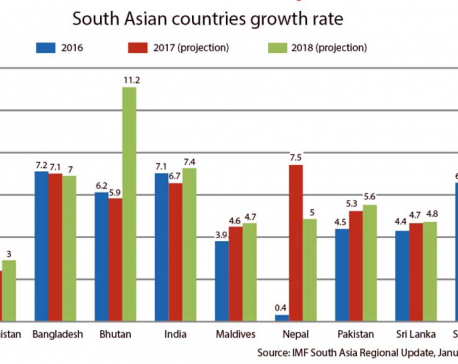 KATHMANDU, Oct 11: Following the World Bank and the Asian Development Bank, the International Monetary Fund (IMF) has also lowered the economic growth forecast for Nepal for the current Fiscal Year 2017/18. Releasing the World Economic Outlook on Tuesday in Washington DC in the US amid the 2017 Annual Meetings of the IMF, the international monetary institution lowered its Nepal’s economic growth forecast to 5 percent. In its earlier WEO released in April this year, the IMF had projected the economy to grow by 5.5 percent. Though it is not immediately clear what led the IMF to lower its growth projection for Nepal by 0.5 percent this year, the forecast by the Washington-based fund is still higher than the World Bank’s 4.6 percent and ADB’s 4.7 percent growth forecasts for the current Fiscal Year 2017/18. Unlike in the previous years when the IMF’s projections used to be comparatively lower than those of other institutions’, the fund seems to be more optimistic about Nepal’s outlook for the current fiscal year. The World Bank and the ADB have partly attributed Nepal’s lower-than-expected growth forecasts to the recent floods in the country’s tarai region. However, the projections of all these three multilateral institutions are far lower than the government’s target of achieving 7.2 percent growth in the current fiscal year. Despite the downward revisions of growth forecast by the World Bank, the ADB and the IMF, senior government officials have continued to assert that the country is on the track to achieve the targeted economic growth. 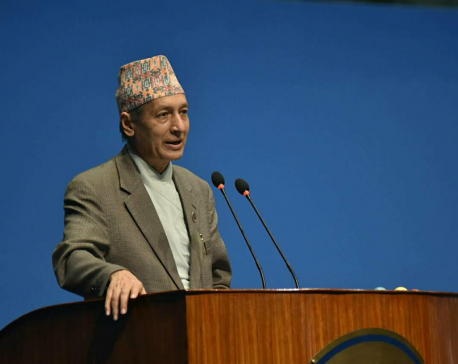 Finance Secretary Shanta Raj Sebedi on Monday said that the growth target of 7.2 percent was achievable this fiscal year. Speaking at a press meet at the ministry, Subedi had said that this year’s flood in the tarai region has not damaged paddy to the extent claimed by the World Bank and the Asian Development Bank. Rather, he said, it has created alluvial soil indicating a further growth of paddy production. Nepal achieved economic growth of 7.5 percent in the last fiscal year -- the highest since FY 1993/94, on the account of low base of the previous fiscal year, rise in agricultural output due to one of the best monsoons in recent years, improvement in industrial growth, end of power cut, and strong revival of growth in tourist arrivals. The IMF has also said that the global recovery is continuing, and at a faster pace. The WEO upgraded its global growth projections to 3.6 percent for this year and 3.7 percent for the next year, in both cases 0.1 percentage points above its previous forecasts. “For 2017, most of our upgrade owes to brighter prospects for the advanced economies, whereas for 2018’s positive revision, emerging market and developing economies play a relatively bigger role. Notably, we expect sub-Saharan Africa, where growth in per capita incomes has on average stalled for the past two years, to improve overall in 2018,” said Maurice Obstfeld, IMF Economic Counsellor and Director of Research in his opening remarks while unveiling the WEO.